diving in after contemplating for … a long time. With a little bit of Christmas money, I had participated in one 3-month round of Hedgehog Fibres’ fibre club from December 2014 to February 2015. 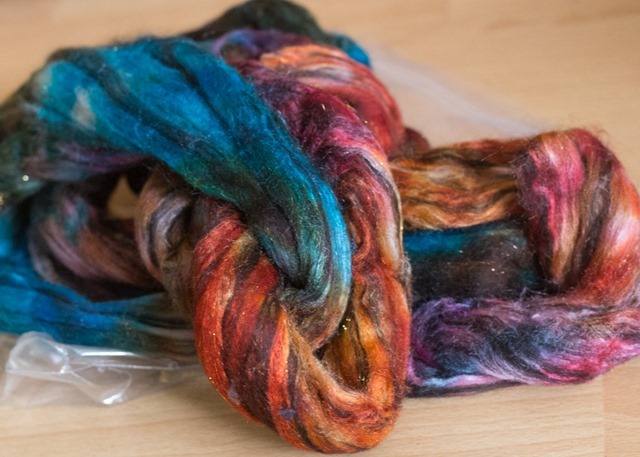 I received 3 shipments of interesting fibre blends that now sit in my stash. I keep pulling them out separately, looking at them, wondering what to do with them and placing them gently back in my cupboard. Don’t get me wrong – I am a huge fan of Beatka’s dying and colours. Huge fan. I love pretty much everything she touches and photographs. 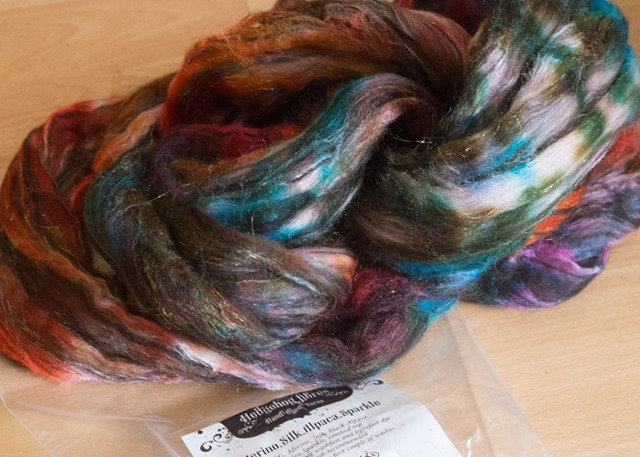 Each of the months’ fibre was beautifully dyed and arrived in my mailbox quickly. The problem I am having comes down to quantity. I bought the double club to have enough fibre to really do something with it – so 250gm of each. It’s a lot of spinning, it’s a lot of prepping. 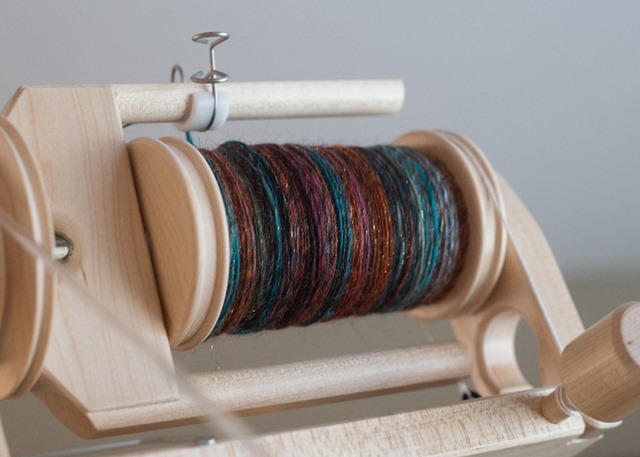 I’ve decided to let the final knitted project go and just spin for the pleasure of spinning such interesting blends. 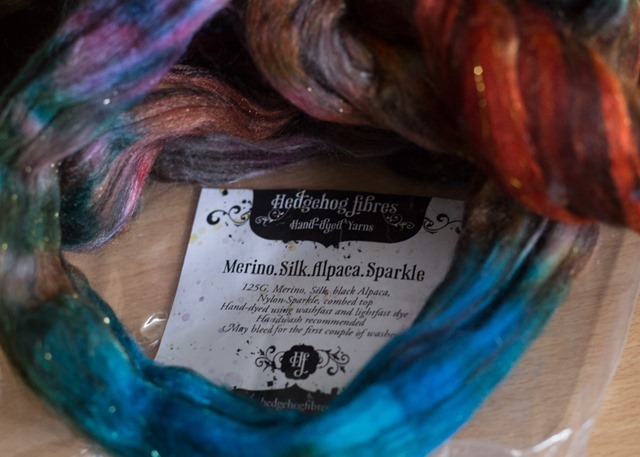 So first up on my wheel was the final shipment I received: a Merino, Silk, Black Alpaca and Sparkle. The light was perfect today to photograph this lovely fibre. The colours are completely true to what it looks like in real life. It is shockingly bright. And the sparkle through out it? Gold. Ack! Heaven. My favourite. Each of these photos are actually showing you different sides of only half of the fibre. I didn’t try to photograph all 250gm at once – you’d never know where to look! 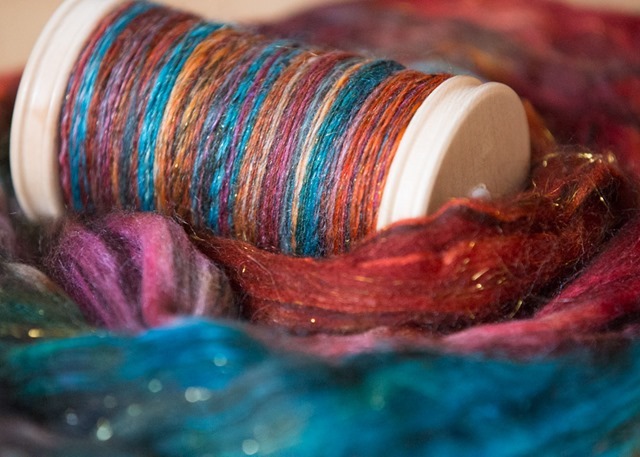 There are a ton of colours in this fibre. Can I dare say (ever so quietly) … too many?! Pre-drafted, tiny little nests ready for spinning. Rainbow-ish when pulled apart. I know, the audacity of me saying that. But honestly, every single colour of the colour wheel, primary and secondary, are in this fibre! Blue, red and yellow, and orange, green and purple. ALL OF THEM! And you know what this fibre makes me think of?! … You’re never going to guess … Okay, I’ll tell you. Bobbin shot :: First ounce almost finished. Due to the black Alpaca, it’s much darker after spinning and very heathered. 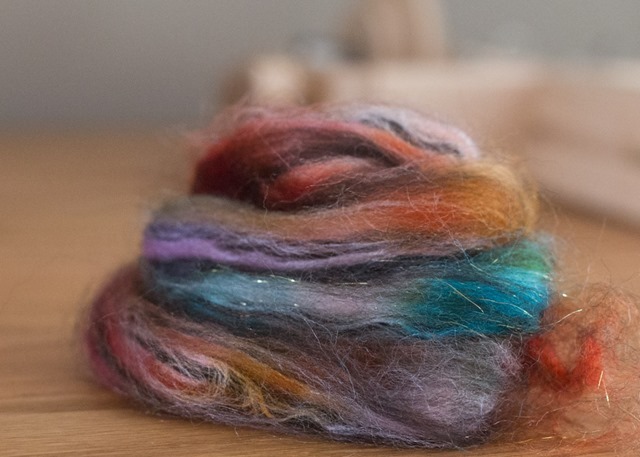 It darkens much with spinning due to the black Alpaca – but what a wonderful effect! 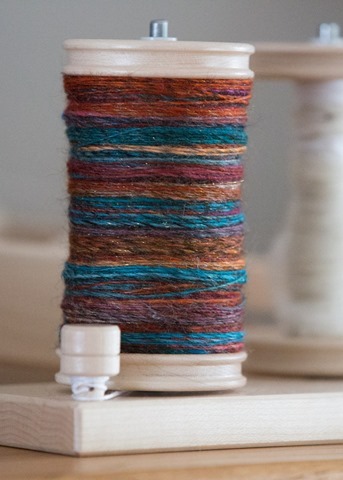 I think plied with black silk thread would be amazing too. Christmas. I don’t know why. It just makes me think of Christmas. It’s luscious, vibrant, gold … which I guess in my book means Christmas?! I’m thinking this is going to be my Christmas 2015 shawl. I am not going to be doing any Christmas knitting again this year. 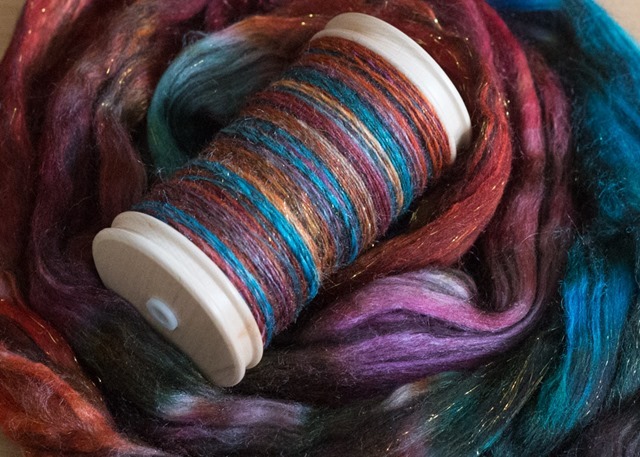 So while thinking about the season, remaining sane (we are travelling this year), and enjoying the company of family and friends, I will be spinning and knitting this! Are you thinking about any major projects this year? Have you started anything? Please, share in the comments! Previous Post is it summer yet?! Next Post Then there were two. I took out that fibre last night and wished I had more of it! I only got the single dose. Thanks for sharing how it spins up. What a good idea to ply with black thread. Then you get more yardage and still the advantage of a ply. Can you tell me what kind of thread and where you’d get it? Not that I’m going to copy you of course. Lol. Wait maybe I would. So beautiful-so lively-kind of like fireworks! And soft too I bet.